One of my favourite (conjectural) anecdotes about Scott concerns the layout of his library at Abbotsford. One particular part of the room catches the maximum hours of sunlight and amongst the books housed in this spot can be found Scott’s comprehensive collection of materials concerning the supernatural. I love the implication that these items are among those that Scott derived most pleasure from reading, and thus were positioned in a place where he could most easily peruse them for as many hours as there was sufficient light in the sky. I’m tickled equally by the idea of Scott settling into his armchair, as the fire glowed and the dusk gathered outside, to lose himself in tales of demons and ghosts, fairies and mythical creatures, witchcraft and lore; to give himself up (albeit temporarily) to the seductive power of the uncanny. Scott’s enjoyment of a supernatural tale was, of course, fostered during his early childhood spent with his grandparents near Smailholm in the Scottish Borders. In Marmion (1808), the second of his grand narrative poems, Scott fondly recalls how he was ‘charmed’ and ‘bewitched’ by the ‘strange’ tales habitually told around the fire ‘Of lovers’ sleights, of ladies’ charms, / Of witches’ spells, of warriors’ arms’.1 His youthful imagination was simultaneously set alight by stories of Scotland’s bloody past: the legendary battles fought by Wallace and Bruce, and the conflicts played out under a succession of Stuart kings and aspirants to the throne (3.196–206). It is this blend of violent Scottish history and Scottish supernaturalism that becomes a key feature of Scott’s early poetry (not to mention of his novels that are set in Scotland). Marmion is a prime example of this. Scott makes extensive use of supernatural motifs, imagery, and subject matter throughout the text, and this is linked to its thematic concern with war. It is a challenging read, not least because of its structure: the medieval narrative, set in the forty days leading up to and including the Battle of Flodden (1513), is framed by six epistles (one prefaces each canto of the poem), and followed by a weighty body of notes. These introductory conversation poems, written in Scott’s voice and each directly addressed to one of his close friends, discuss autobiographical and contemporary political issues. The double timeframe,2 and apparent disconnect of epistles to narrative proved challenging to Scott’s early audience. Many read them separately and had access only to a version of the poem in which Scott’s notes were either heavily abridged or simply spirited away altogether, as it were, by over-zealous editors with an eye on profit margins. However, to engage fully with the poem it is necessary to understand its three components in their inter-referential relation to one another; their shared preoccupation with the supernatural offers one of the primary means of doing so. 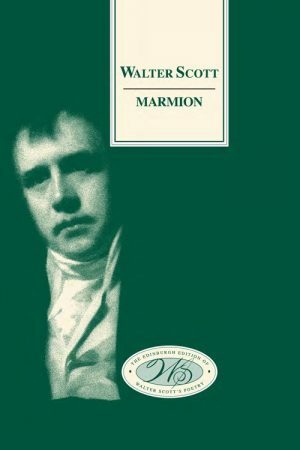 Marmion’s structure enables Scott to present a model of history in which distinctions between historical periods appear artificial: the divide between present and past (just as that between reality and fantasy, the material and the immaterial) is dissolved. Death and decay, the afterlife and systems of belief in the afterlife, and the figure of the revenant, are central concerns throughout the text. The idea of a person returning from the ‘realms of death’ (6.145) to right a wrong done to them in life is of interest to Scott in part because it allows him to explore the debilitating psychological effects of a guilty conscience and the role of superstition in relation to supernatural agency. To understand the poem’s preoccupation with death and its predominantly elegiac tone, it is helpful to remind ourselves of the context in which it was written. Marmion was composed against the backdrop of the Napoleonic Wars (1803–1815) during a period of mass military mobilisation and heavy fatalities in battle. The epistles offer tribute to eminent figures who have fallen in the course of these conflicts: Admiral Horatio Lord Nelson, the Duke of Brunswick (father to Caroline, Princess of Wales), and Sir Ralph Abercromby.3 The most stirring requiems are saved for Britain’s leaders, William Pitt and Charles Fox. Drawing upon mythological language and analogies to Virgil’s Aeneid (29–19 BC) and Spenser’s Faerie Queene (1590), Scott elevates not only Pitt and Fox, but also Napoleon to the status of supernatural entities. Pitt and Fox, who with ‘more than mortal powers endowed’ are likened to ‘fabled Gods’ (1.166–70) and Napoleon is transmuted into a ‘dragon’, or devil sent to scourge earth for her sins (3.59). Death is personified and hovers over the dying Pitt, vampire-like, waiting to claim his prey (1.110). Scott’s reconstruction of the wars in romance terms is to some extent a bid to reawaken the spirit of chivalry, to bolster the war effort. However, it also reveals his despondency at the vacuum created by the loss of these leaders and his fears that there is no one left capable of dealing with Napoleon, the seemingly supernatural, ‘Invincible’ foe (3.88). The sense of loss (both personal and collective) that characterises the epistles is carried over into the poem’s story, and particularly into its final two cantos. In the fifth canto, the detailed description of James IV and the glittering feast over which he presides on the eve before the Scottish army march to Flodden has poignancy for all of Scott’s readers because we know what is going to happen next: ‘This feast outshone his banquets past; / It was his blithest ─ and his last.’ (5.374–5) The poem’s concluding canto, with its description of the battle, becomes a lament for a lost generation. Flodden is widely agreed to be one of the bloodiest encounters in the history of Anglo-Scottish warfare, and it is unsurprising that a host of superstitious stories arose in its wake. For example, the sixteenth-century Scottish historian Robert Lindsay of Pitscottie, referenced frequently in Scott’s annotations to Marmion, tells of four horsemen who appeared at the battle to spirit James IV away to an unknown fate. This tale arose out of the mass of rumours, almost all asserting that James IV had escaped death on the field, which proliferated in the battle’s aftermath. Norman Macdougall identifies these riders as the four horsemen of the apocalypse and accounts for these stories as ‘arising out of the refusal of the Scots to come to terms with the awfulness of Flodden’. He goes on to suggest that they ‘constitute a remarkable exercise in collective wish fulfilment.’4 In times of profound distress we perform private rituals, supplicate God (or gods), search for auguries, and attach superstitious significance to things of no intrinsic value. It is in these moments that we are most susceptible to superstitious beliefs: the need to believe in something makes belief in everything that little bit more possible. The refusal to accept the finality of death and a readiness to give credence to the concept of life beyond the grave is caused not only by extreme grief but by another psychological condition: guilt. The preceding cantos of the poem are marked by their exploration of this topic and its connection to the superstitious beliefs relating to the afterlife prevalent in the pre-Reformation period. The second canto opens with a group of Saint Hilda’s nuns setting sail across a sublime seascape on their way to Lindisfarne Priory.5 Once there, they trade rival tales of the miracles performed by their Saint with those of their hosts’ Saint Cuthbert. Cuthbert appears to have agency from beyond the grave, directing his followers where to carry his body until at last he settles upon his final resting place in Durham. The local fishermen believe he rises on stormy nights to sit on the rocks and forge bead-like fossils which are then strung together to make rosaries (2.565–76). These narratives lead on to the revelation of a secret vault concealed beneath the monastery which is a place of punishment for those who have ‘died in mortal sin’ (2.593). Superstition has it that the ‘spirits of the sinful dead / Bemoaned their torments there’ (2.599–600), and it is in this spot that one of the poem’s central characters is about to meet a horrible end. Constance de Beverley, perjured nun and one-time lover of Lord Marmion, is sentenced to immurement within the vault’s walls. Constance warns her executioners to ‘dread me, from my living tomb’ (2.31). This ominous warning, spoken in the ‘tone of prophecy’ (2.858), coupled with the supernatural stories set up at the start of this canto prepares the reader for Constance’s disembodied reappearance (of a kind) later in the poem. And this in turn paves the way for de Wilton’s ‘resurrection’ when his identity is revealed in poem’s final canto.6 Continuing Scott’s supernatural theme, cantos three and four unfold as an extended series of ghost stories, each of which detail encounters with spirit entities and (real or imagined) revenant foes. Scott makes explicit the connection between these supposed apparitions and the guilty conscience of the person to whom they make their appearance. The narrative mimics the way in which storytelling itself proceeds; one story begetting the next in a kind of chain reaction of listen and tell. And Scott joins in the process, expanding upon and inserting yet further tales of the supernatural into the notes that follow the poem. Scott’s lengthy notes are arguably the most interesting (and certainly the most neglected) aspect of the text. Ostensibly included to offer antiquarian and ethnographical commentary, to divide the sceptical present from the superstitious past, their primary function is really to allow Scott to do what he loves doing best: that is, to tell a good story (and this is especially appealing when that story has a supernatural element to it). Significantly, a quarter of these 97 notes are devoted to supernatural topics including saints, spirits, shape-shifters, miracles, magic, magicians, fairies, demons, angels, goblins, revenants, prophecies, witchcraft, and the tradition of superstitious belief in Scotland. As I write this, I am profoundly aware that today marks the 100 year anniversary since the Armistice brought an end to World War One (and that, fittingly, it falls on Remembrance Day in the UK). Throughout the War’s centenary (2014–18), a great many commemorative events have taken place. Not least of these has been the screening of Peter Jackson’s moving documentary, They Shall Not Grow Old (2018). Through the ‘magic’ of modern technology, Jackson has resurrected the voices of some of those men involved in the War, to allow them speak from beyond the grave and to share the story of their involvement in this conflict. In Marmion, poetry is presented as a form of magic and poets are positioned as operators in a celestial realm: Spenser’s dream is ‘elfin’, Milton’s theme is ‘heavenly’, Dryden’s labour is ‘immortal’ (1.275–7), Joanna Ballie is cast as ‘the bold Enchantress’ (Intro 3), and George Ellis’s poetry pitched as a ’magic art’ (5.161–2). Art may stop short of performing the miracle of resurrection, but it can at least ensure that those who have died are not forgotten. In his ‘Introductory Epistle’ to The Fortunes of Nigel (1822), Scott famously describes creativity as ‘a dæmon who seats himself on the feather of my pen when I begin to write.’9 (And this trope of supernatural intervention in the writing process can be extended all the way to the ‘printer’s devils’ in the printing house who turned Scott’s manuscripts into books).10 Scott’s metaphor both conveys the sense that, in its operation, imaginative power is inextricably linked to the occult and suggests its centrality to his work. Hopefully, I have been able to share a flavour of its intrinsic role in Marmion, but really I’ve done little more than to scratch the surface of the multiplicity of ways in which Scott employs the discourse of the supernatural in this poem. Yes, this is undoubtedly a challenging read, but the rewards outweigh the labour. So, I encourage you to channel the spirit of Scott: pull up a chair, settle yourself in, and allow yourself to be enchanted by the magic that is conjured within the pages of this work by Walter Scott, Wizard of the North.